(Newser) – Canadians are infiltrating the US in record numbers on brief missions to buy milk and vacuum cleaners. Why the sudden spike in "shopping vacations"? The Canadian dollar is strong, Canadian law now permits a larger allowance for duty-free goods, and post-9/11 border control has gradually relaxed, reports USA Today. 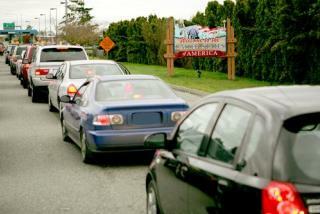 Canadians journeyed to the US for 1.9 million overnight visits in June, the highest level in 40 years. This is not news. We've been doing this for years, especially since our dollar came on par with the USD. Canadians are theifs stay in your own country and pay your socialist taxes.